Thank you for visiting the Internet web site of Colex. We hope that you find the information here interesting and helpful. Please read this visitor agreement carefully. By using this site, you accept and agree to the terms and conditions stated below. If you do not agree, you should not use this site. As a condition of your use of this site, you warrant that you will not use the site for any purpose that is unlawful, inappropriate, or prohibited by the terms of this agreement. We may change the terms of this agreement at any time and you should periodically review this visitor agreement. Your use of this site after any change is your agreement to accept the revised visitor agreement. 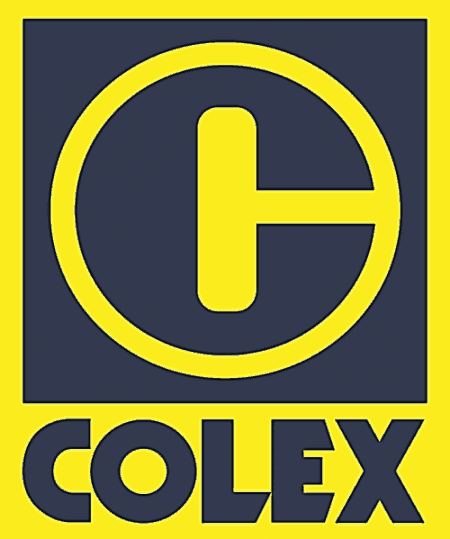 The materials on this site are the property of Colex. Although Colex makes this site freely accessible, we are not giving up any rights to the materials appearing on this site. No title or rights are transferred through the use of this site. You may not use any trademark or service mark appearing on this site without our prior written consent. The contents of this site may be viewed, downloaded, saved, and printed only for personal, non-commercial purposes, provided that you do not delete or change any copyright, trademark or similar notice. All other use, reproduction, distribution, republication, uploading, posting, transmitting, linking, and the like is prohibited without the prior written consent of Colex. All remarks, suggestions, ideas, graphics, data, questions or other information communicated to Colex through this site or through electronic mail will forever be the property of Colex. Colex will not treat any submission as confidential or proprietary and will not be liable for the use of any ideas for its business (including without limitation, product or advertising ideas) and will not incur any liability as a result of any similarities that may appear in Colex operations in the future. Without limitation, Colex will have exclusive ownership of all present and future existing rights to the submission of every kind and nature everywhere. Colex will be entitled to use the submission for any commercial or other purpose whatsoever, without compensation to you or any other person sending the submission. You acknowledge that you are responsible for whatever material you submit, and you, not Colex have full responsibility for the message, including its legality, reliability, appropriateness, originality, and copyright. You agree to indemnify Colex against any and all damages, costs, and expenses, including reasonable attorney fees, which may arise out of claims relating to your use of this site or your submissions to this site, including claims by third parties that your submissions violate their rights, and claims that your submissions contain obscenities or defamatory or offensive materials. Personal information that you may choose to submit to this site is done so in your sole discretion. You agree that your use of this site is at your sole risk. With the various hazards and uncertainties of electronic distribution, there may be delays, omissions, inaccuracies, viruses, technical mistakes, or other problems with information at this site and on the internet in general. If you rely on this site or any material available through this service, you do so at your own risk. You understand that you are solely responsible for any damage to your computer system or loss of data that results from any materials and/or data downloaded from or otherwise provided by this site. COLEX IS NOT LIABLE FOR ANY DAMAGES OR INJURY CAUSED BY, WITHOUT LIMITATION, ANY FAILURE OF PERFORMANCE, ERROR, OMISSION, INTERRUPTION, DEFECT, DELAY IN OPERATION OF TRANSMISSION, COMPUTER VIRUS, OR LINE FAILURE. THIS INCLUDES ANY SPECIAL OR CONSEQUENTIAL DAMAGES OR DAMAGES ASSOCIATED WITH LOSS OF DATA, LOSS OF USE, LOSS OF PROFITS, LOSS OF SAVINGS OR LOSS OF GOODWILL THAT RESULT FROM THE USE OR INABILITY TO USE THIS SITE OR ANYTHING DOWNLOADED FROM THIS SITE. THE MATERIALS AT THIS SITE ARE PROVIDED “AS IS” AND WITHOUT WARRANTIES OF ANY KIND, EITHER EXPRESSED OR IMPLIED, TO THE FULLEST EXTENT PERMISSIBLE BY LAW.COLEX DISCLAIMS ALL WARRANTIES OF MERCHANTABILITY AND FITNESS FOR A PARTICULAR PURPOSE, AND DO NOT WARRANT THAT THE FUNCTIONS CONTAINED IN THIS SITE WILL BE ERROR-FREE OR CONTINUOUSLY AVAILABLE, THAT DEFECTS WILL BE CORRECTED, OR THAT THIS SITE IS FREE OF VIRUSES OR OTHER HARMFUL COMPONENTS. COLEX DOES NOT WARRANT OR MAKE ANY REPRESENTATION REGARDING THE USE OF THE MATERIALS ON THIS SITE IN TERMS OF CORRECTNESS, ACCURACY, RELIABILITY, OR OTHERWISE. YOU ASSUME THE ENTIRE COST OF ALL NECESSARY SERVICING, REPAIR OR CORRECTION. Colex respects the privacy of on-line visitors. As a general policy, no personal information is automatically collected from visitors to the site. However, certain non-personal information of visitors is recorded by the standard operation of Colex internet servers. This information is primarily used to provide an enhanced online experience for the visitor. Information tracked includes the type of operating system in use (e.g., Macintosh, Windows) and the type of browser being used by the visitor (e.g. Netscape, Internet Explorer). Other uses of this information include internal review of the number of visitors to the site but only in an aggregate and non-traceable form. E-mail addresses and other personally identifiable information such as a first and last name, home or other physical address, telephone number, about visitors to this site are known only when voluntarily submitted for example via registration for contests, content submissions, suggestions or participation of visitors in any available online interactive activities. Unless otherwise disclosed during the collection, personally identifiable information that may be collected in connection with visitors to this site is retained by Colex and is not sold, transferred or otherwise disclosed outside the company, except where disclosure is required by law. This information may be used for any of the following purposes: (1) to help Colex better understand visitors’ use of our site; (2) to respond to specific requests from our visitors; (3) to protect the security or integrity of our site when necessary. Information collected through our site is considered a trade secret of Colex. As the owner of such information, we may disclose or sell such information as an asset of the company in conjunction with the sale to a third party of our company or a portion of our assets. This site is controlled by Colex from its headquarters in Singapore. This visitor agreement shall be construed in accordance with the laws of the Republic of Singapore, regardless of any conflicts of law principals. If you use this site from other locations, you are responsible for compliance with applicable local laws. If you download anything from this site, you represent that you are not a national of, or located in, any country subject to export embargo controls by the Republic of Singapore, and that you are not otherwise prohibited from receiving such information. By using this service, you agree to abide by the terms of this visitor agreement and you consent to the exclusive jurisdiction of the state and federal courts in Singapore, for all disputes arising out of or relating to this agreement or the use of this web site.